An ankle sprain occurs when the ligaments in your ankle become damaged. Usually, an ankle sprain will happen when the foot is twisted during physical activity. The twisting motion can cause too much tension on the ligaments which causes the foot to lose movement. A loss of motion in the ankle limits your ability to continue participating in your routine daily activities. 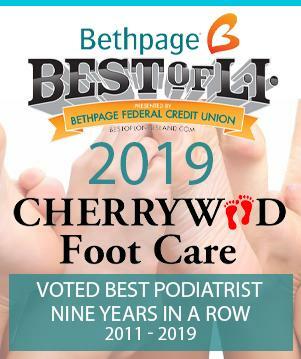 Our podiatrist in Nassau County at Cherrywood Foot Care can treat your injuries and will get your ankle back to full health! A common treatment method for an ankle sprain is the “RICE” method, which is an acronym for rest, ice, compression, and elevation. Resting your ankle sprain keeps the damage from worsening. Putting extra pressure on a damaged ligament can make the sprain worse and increase the risk of future injury. Icing a sprain is also an important step to take note of. Regularly icing your ankle will help reduce some of the swelling and inflammation. However, it’s important to note that you shouldn’t keep the ice on the injury for any longer than 20 minutes. Compression has a lot of benefits with regard to a proper recovery process. Not only does it keep swelling down, but it also offers support for your ankle and can increase mobility in the ankle. Our podiatrist in Nassau County will assess your ankle sprain during your visit, but before you get to our office, taking the steps to keep your ankle sprain from being damaged any further is incredibly important. If your ankle sprain goes untreated, you will limit your level of participation in daily activities. Don’t wait to start getting the treatment you deserve! Contact our podiatrist in Nassau County at Cherrywood Foot Care and we’ll nurse your foot injuries back to health.